The 7-way Sampler: Our seven best sellers! 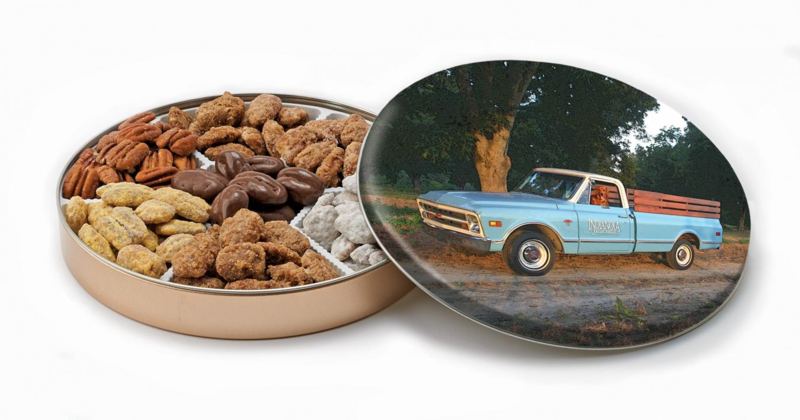 Our Collector's Tin, Cooper at the Wheel, is loaded with seven scrumptious pecan favorites! Southern Praline, Honey, Key Lime, Cinnamon, Roasted & Salted, Cappuccino, and Chocolate Covered Pecan Halves.
! !DUE TO SUMMER'S HIGH HEAT, WE ARE UNABLE TO SHIP CHOCOLATE DURING THE SUMMER MONTHS OF MAY THROUGH SEPTEMBER! !